Job management and invoices is now handled by Okappy’s simple job sheet software. With Okappy you can easily connect to your external accounting packages such as Sage Line 50 and Xero. 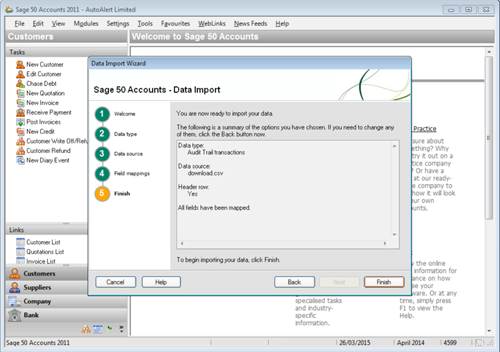 Find out more about raising an invoice for a job and exporting jobs to Sage. The following fields are not exported from AutoAlert, but can be added to the spreadsheet if required before uploading to Sage. To be on the safe side it’s always worth backing up your data first by clicking on the Backup button. Note: Once you’ve selected the file you may need to again check the option for CSV as Sage sometimes defaults back to xlsx and then shows an error saying the file cannot be read. It also helps to click open rather than double clicking on the file name to select the file. Typically errors could occur if the file has data for a field which is not matched in Sage, i.e., if you have a client identifier of MISA in AutoAlert but it is MISC in Sage or if a nominal code is used such as 4200 which is not present in your Sage chart of accounts. Note: Once your invoices have been exported from AutoAlert, they cannot be exported again so it is often worth keeping a copy of the export file. 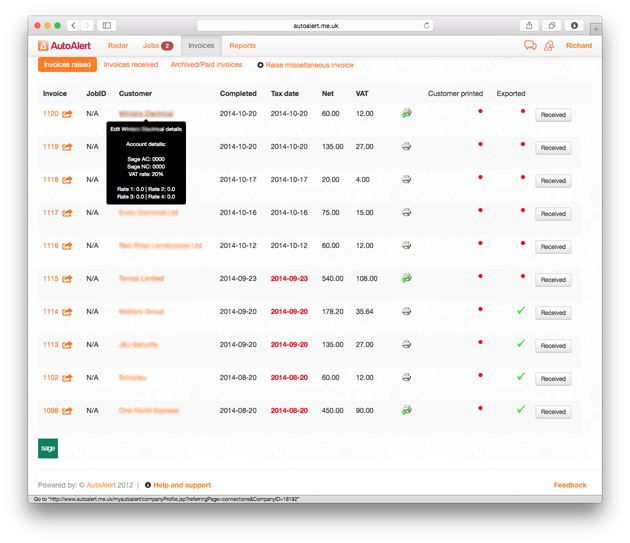 You can also check the account details from within AutoAlert to make sure the file is populated correctly the next time. The jobs screen shows the status of all of your jobs with various icons to denote whether a task has been completed or is running late. Following is what each icon denotes. Note: You can change which columns are shown on your jobs screen by clicking Advanced Job Settings, clicking Change Page Layout and selecting which columns you want to show. SMS has not been sent. Job has not been viewed. An hour has passed and the job has still not been viewed. Appointment has not been made. Two hours have passed since the job was created and an appointment has not been made. If no one was available to make an appointment. Its past the appointment date and time but the Engineer is not on site. Two hours have passed since the appointment date and time and the engineer is still not on site. Engineer has not completed job. The job has not been completed within two hours. Paperwork has not been completed for the job. The job paperwork has not been completed within 24 hours. The job paperwork has been completed. If it for a customer, then the invoice is ready to be raised. With AutoAlert, you can easily raise invoices for your jobs, send them to your customers and/or export your invoices to Sage. 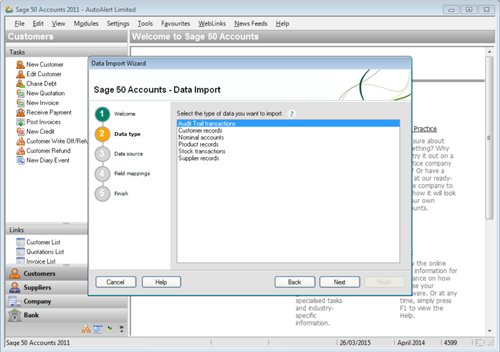 To export your invoices to Sage, first raise invoices for your customers jobs or create ad-hoc invoices for your customers. To view all the invoices you have raised, click the invoices button from your job screen or click the invoices option on your tab bar, if enabled. The invoices screen shows all the invoices you have raised. Hovering over your customers name will display the Sage nominal codes which you have entered for that customer. Click the customers name to add or edit your customers nominal codes. 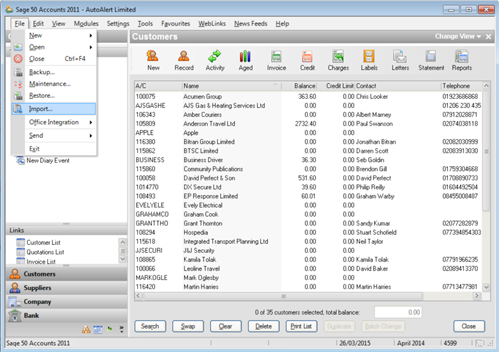 The next columns show whether you have printed the invoice. 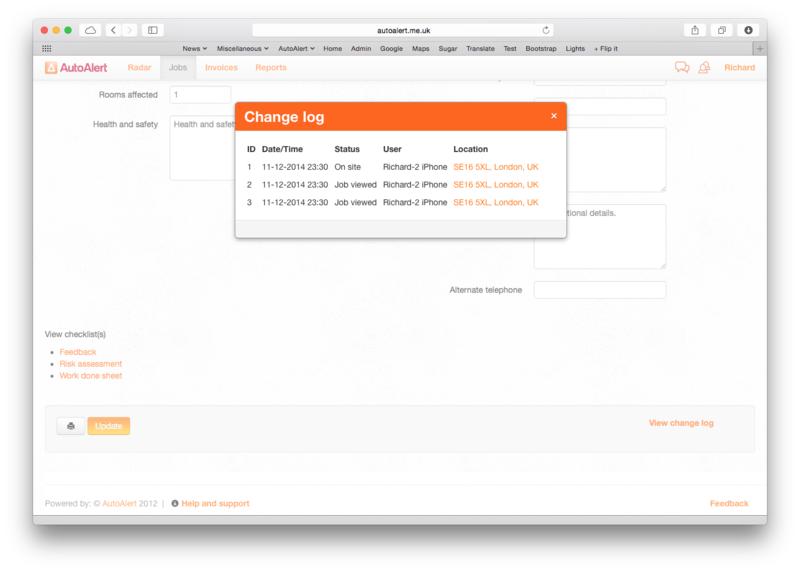 You can see whether your customer has viewed and printed the invoice (this requires your customer to have authorised an account with AutoAlert and logged in. See connecting to your customer for more information about connecting to your customers and subcontractors). The exported column shows whether you have exported the invoice to Sage. To export your invoices to Sage, simply click the Sage icon ( ) at the bottom of the page. 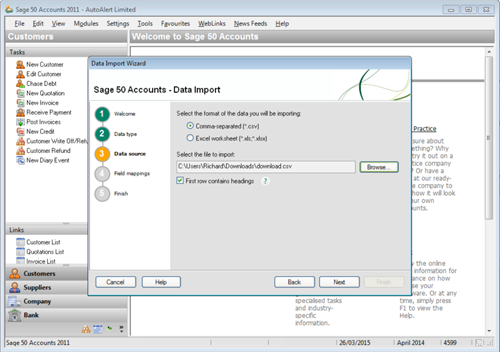 This will create a CSV file in the format required for Sage. 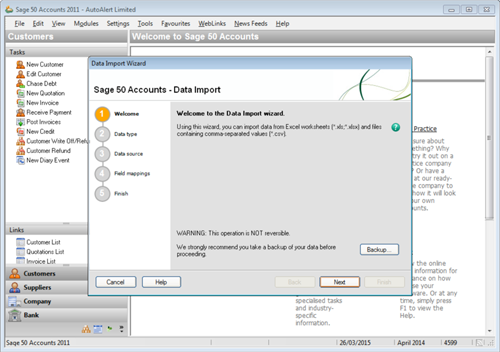 It will include all the Sage nominal codes you have saved for each customer. 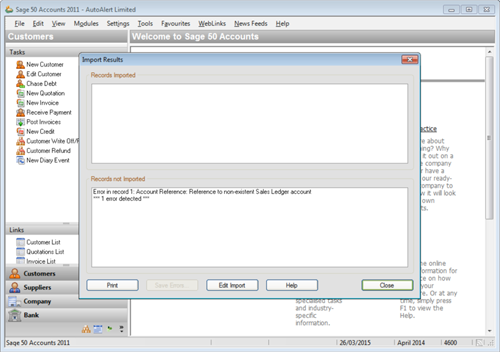 You can then import the invoices directly into Sage using the Sage import process. Once the invoice has been exported, it will show as ticked in the exported column and cannot be re-exported. Once payment for your invoice has been recognised and the invoice has been exported then it will automaticaly be archived from the main invoice screen. To view your archived invoices, click Archived/Paid invoices from the top of invoices screen. With AutoAlert Job Management, you can raise an invoice for your customer once you have completed one of their jobs. You can also raise ad hoc invoices for a customer at any time. Ensure that the invoices raised option is selected. 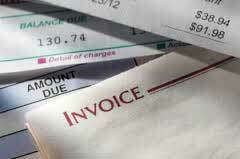 The invoice will be immediately available in your customer’s account. You can also email them a copy of the invoice or send a text message if you are concerned that the invoice may become overdue. 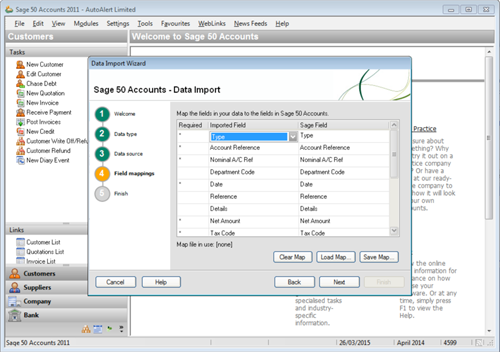 Find out more about AutoAlert Job Management or check out our support centre for information on exporting your invoices to Sage.